The ultrasonic flowmeter in beverage dispensing systems for alcoholic and nonalcoholic drinks. The contact-free flow measurement with no moving parts is wear and maintenance free. The free pipe cross-section over the whole channel geometry meets maximum hygienic requirements. Mechanical and / or chemical cleaning is possible without affecting the meters. Opening the beverage line and the meter can be dropped. The integrated foam monitor with empty pipe messages through alarm output provides additional information. High protection against manipulation and guaranteed long-term stable measurement results. Simple electrical connection with circular connector in IP65 for connection to Flowview 2S-II. 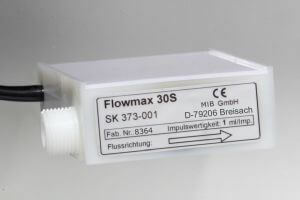 Flowmax® 30S is an ideal sensor for computer beverage dispensing systems.